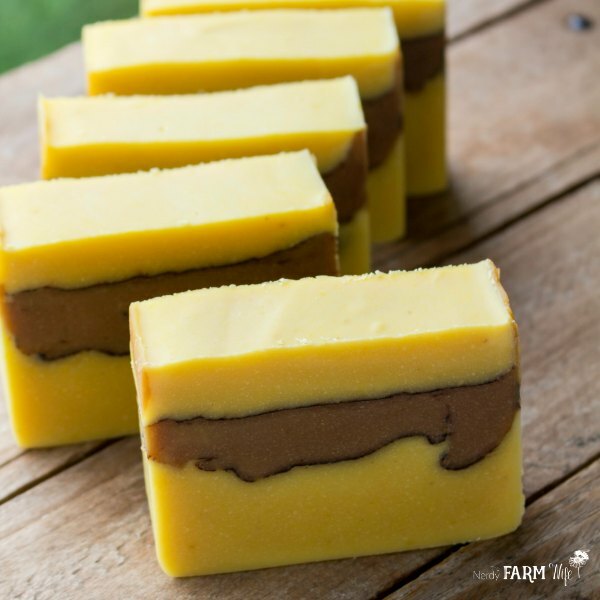 This fall favorite soap is made with real pumpkin puree and features a spiced layer that’s deliciously scented with coffee, cinnamon and clove essential oils, and highlighted by two contrasting pencil lines made of cocoa powder. 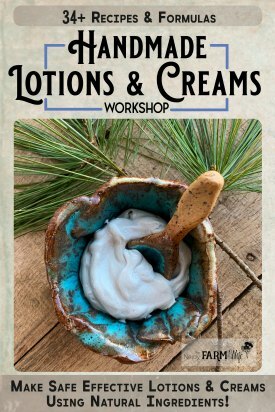 It’s a brand new addition to my Soapmaking Success e-course, but was so well received by local friends and perfect for the season, that I had to share here on my website too! Since it’s part of the course, I’ve included the tutorial video (directly below) along with the accompanying recipe printable (further down in this post). Make the lye solution and set aside to cool. Melt the coconut oil and cocoa butter, then add to the liquid oils. Blend the pumpkin puree directly into the warmed oils until completely incorporated, then add the lye solution. Blend to a very light trace. Weigh around 10 oz (283 g) of soap batter into a separate container and set aside. Pour half of the remaining plain pumpkin soap batter into the soap mold and then sift a very fine layer of cocoa powder over the top. Carefully spoon this spiced layer into the mold and smooth the surface with a spatula. Sift another fine layer of cocoa powder over this layer, then pour the remaining soap into the mold. Soap mold used is a regular Crafter’s Choice Silicone Mold (find here). Mesh teaspoon used for sifting on cocoa powder lines was purchased HERE from Mountain Rose Herbs. 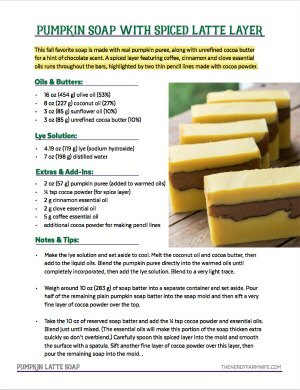 Click HERE or on the image below for the printable PDF recipe. Tagged pumpkin, pumpkin spice. Bookmark the permalink. Loved the video! Thank you for sharing. 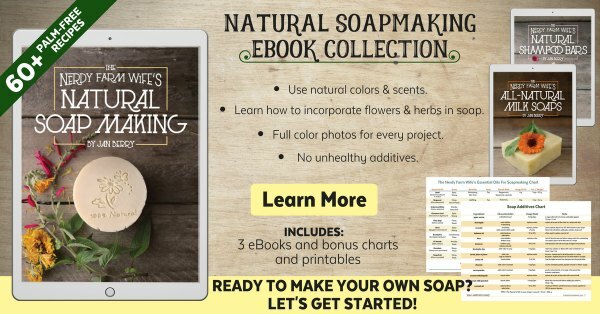 I’ve dabbled in soapmaking for over twenty years, but there’s always more to learn. Where did you get the soap cutter? I only have coffee fragrance oil, would that work? I don’t have the coffee essential oil, what could I add to mix with the cinnamon and clove? 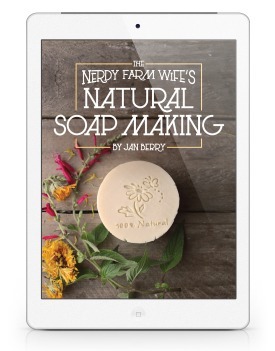 I want to buy it, but I don’t want to wait to make the soap! I love that you use natural colours and essential oils. You book and course have been a huge inspiration to me. Do you think I could try this with goats milk instead of the water? I made this last night. I didn’t allow it to go through gel stage. I was concerned it would overheat. Waiting with fingers crossed to see how it turns out. Did you let yours gel or not. I didn’t see anything in your notes about that. Thanks for the recipe. Hi Mary! Yes, I let mine go through gel phase. I almost always let my soaps gel, mostly because I prefer that way, especially how it helps natural colors develop nicely, but also I don’t have a lot of free refrigerator space. :) I hope your soap turns out well! Because this is cold process, I need to cover and wrap this for the 24-48 it is in the mold correct? Sorry, I am still new to this. Thanks!